Now, I’m not a candidate to believe in curses– I mean, it’s not like the Chicago Cubs have NEVER won another game of baseball. But when that goofy, recalcitrant meth addict marched his billy goat past my nail salon, wearing an albatross affixed with duct tape around his neck, I knew it was time to abandon my hermeneutical attitude and embrace an adaptation of syzygy, admitting that there may be some other evil and vulgar forces asserting their awesome influence in my sheltered world. I raced to my book of iconography hoping to discover a depiction of some sort of contraption that would transplant the less than stealth rebel back to whatever swamp he emerged from. Finding nothing in that book, I decided to check the internet, where along with a video of a colonoscopy, I found a counter-curse– but it must be performed within 2 hours of the original curse. “Bonzai!” I screamed as I leapt out the door holding a silver bullet, a turkey, and a jar of applesauce, desperate to beat the curse deadline. 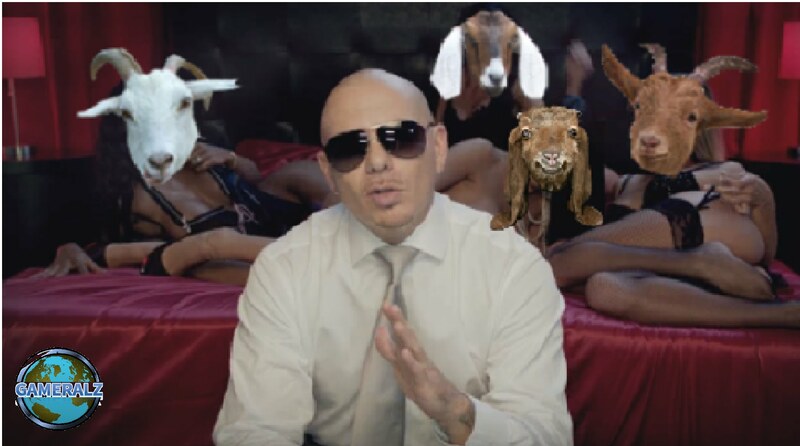 “Hey Baby,” said Pitbull, grinning. “I was wondering what it would take to get you out of that shop, and get me into your va-ja-ja.” Holy Cow! I hadn’t recognized him due to his recent blepharoplasty. It might have been funny if I didn’t have such a headache.